Infinox Capital, a London-headquartered forex brokerage with an office in Shanghai, is making a broader push into newer markets, culminating in a new hire in Latin America (LATAM). The former sales executive at Tradeview Markets, Ricardo A. Grados, has been installed as Infinox’s newest head of LATAM FX business. Ricardo has stepped into his new role since October, according to information made public on his LinkedIn profile. He will help solidify Infinox’s operations in the LATAM region as well, bringing several years of expertise in the FX space to the role. Originally called GO Markets UK, the firm rebranded to INFINOX in 2014. As an FCA-regulated brokerage, Infinox offers its trading services to clients on a global scale. Last month, Grados parted ways with multi-asset brokerage Tradeview after nearly a three-year stint, where he most recently served as the group’s vice president of sales and trading. Grados posted earlier on his LinkedIn profile that he is now leading a relative newcomer to the blockchain industry under the brand Forex Coin, which is looking to use Bitcoin’s underlying technology to streamline certain investment activities such as the social trading and asset management. However, the information about his foray into the cryptocurrency world was entirely removed from his account page. 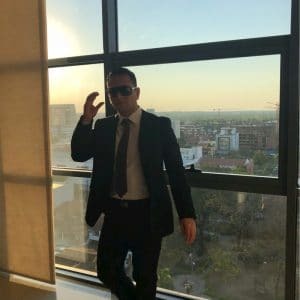 Nevertheless, Ricardo shares more of his interest around cryptocurrency in LinkedIn posts, pointing out the opportunities that exist within the blockchain, adding that the technology is needed to disrupt diverse industries, including his field of expertise. Grados has been deeply involved in the derivatives industry since 2005 when he started his career. His 13 years in the industry include senior positions at Soros Fund Management (Quantum), Barclays Capital Systems, and New York-based BBVA Securities. Prior to joining Tradeview in 2016, Grados worked as head of Business Development and FX Trading at Monaco Private Capital Corp. This appointment followed his departure from the FCA-regulated FX and CFDs broker City Credit Capital, where he served as Introducing Broker and Head of Sales-Peru for nearly two years. Grados’s departure comes amidst a transition period at Tradeview, which saw a number of executive reshuffles and new projects in recent months.